Explore the caves and caverns that are home to local seals! Newquay’s natural habitats take centre stage on our unique, eco SUP tours. The perfect alternative to our high-octane SUP challenges, this eco adventure is a chilled-out exploration of Cornwall’s stunning coastlines. You’ll learn new SUP skills and also gain a new appreciation of Newquay’s awesome coastal environment. We’ve collaborated with the Cornwall Wildlife Trust to develop a wildlife focused paddle boarding adventure, unique for it’s chilled out vibes and educational eco-twist! 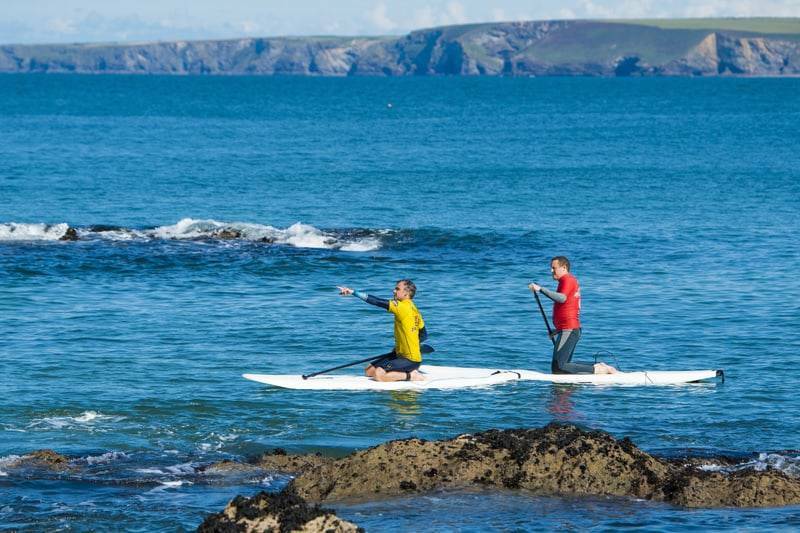 You and your qualified SUP instructor will launch from Towan beach and paddle around the sheltered coastline, exploring smugglers caves and hidden coves otherwise inaccessible from land. We’ve developed our SUP routes in collaboration with the Cornwall Wildlife Trust to give our instructors an in-depth knowledge of the area’s flora and fauna. Together you’ll identify the seabirds, crabs, lobsters, seal colonies and dolphins that call our coastlines home! Keep your eyes peeled for inquisitive visitors popping up beside your board! The deck of your stand up paddle board is the perfect place to view our coastline from. Not only is the scenery stunning, you’ll be able to get up close to the cliff line, into the caves and caverns and take charge of the route for the ultimate tailored adventure. Our reviews on Trip Advisor rank Newquay Activity Centre as number one for Cornwall activities including stand up paddle boarding and we’re proud double gold winners of the Cornish Tourism awards.